Roboats will plough Amsterdam canals sometime next year. 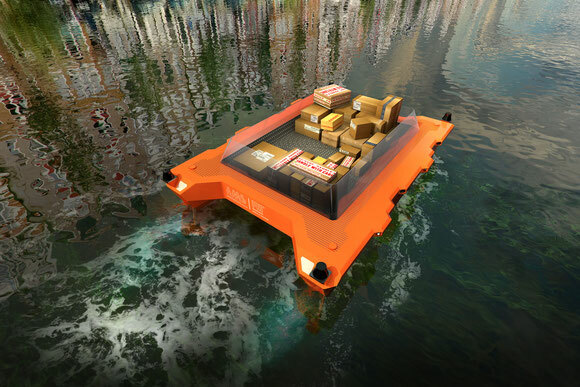 A collaborative research project between the Massachusetts Institute of Technology (MIT) and the Amsterdam Institute for Advanced Metropolitan Solutions (AMS) is designing and testing the world's first fleet of autonomous boats in Amsterdam. The Roboat Project is eying a range of applications for the autonomous vehicle, including monitoring Amsterdam’s canals for environmental purposes, and creating temporary floating infrastructures, such as self-assembling bridges and concert stages. However, the project is also targeting “transporting goods” as a possible application as roads alongside Amsterdam's canals are notoriously congested. MIT and AMS announced the Roboat project last month. The five-year project reportedly has €25m in funding. The first Roboats are scheduled to appear on Amsterdam’s canals in 2017. Payload Asia and Contineo, a leading logistics and shipping media in Asia, recognized the performance of the ECS Group with the Industry Choice Award for being voted best GSA/GSSA of the year. The accolade honors the reliability and performance excellence which are core values in logistics, particularly for sales agents acting on behalf of their customers. During the price-giving ceremony it was stressed that the ECS Group achieved the highest ranking in terms of performance, attention to quality and innovative leadership. The ranking includes indicators such as consistency, effective communication and collaboration, process compliance, quality assessments and market and sales data mining and sharing. Asian company Kerry Logistics has rebranded Swedish Albini & Pitigliani Sverige AB (ALPI Sverige) into Kerry Logistics (Sweden) AB. The renaming ceremony took place last week at the Kerry Logistics facilities in Boras attended by more than 100 invited guests, including clients and suppliers. ALPI was founded in 1999, concentrating on European road and rail transports from Italy as well as shipping from and to the Far East. In the years after, the international business expanded. In 2013, Kerry Logistics purchased 50 % of shares of ALPI Sverige from its parent company Albini & Pitigliani in Prato, Italy, and started the integration of the ALPI business into its global network. The rebranding of the Swedish firm now concludes the process. “Sweden is an important market for us and also for the network, in particular in the Far East and the Indian Subcontinent. We see great potential for further expansion of our capabilities, our geographic footprint and the service portfolio in Sweden,” stated Thomas Blank, Managing Director Europe at Kerry Logistics, at the rebranding ceremony. “We have established a very solid and loyal client base in Boras. Expanding our business in Sweden in the near future is a concrete plan for us,” added Torbjoern Hagberg, Managing Director of Kerry Logistics (Sweden) AB. Last Friday, Luxembourg’s national carrier has received its 14th Boeing 747-8 all-cargo aircraft (LX-VCN). Originally, the large freighter named “Spirit of Schengen” was scheduled for delivery only next year. However, due to the upcoming high season in air freight, Cargolux and Boeing agreed on an earlier delivery date. 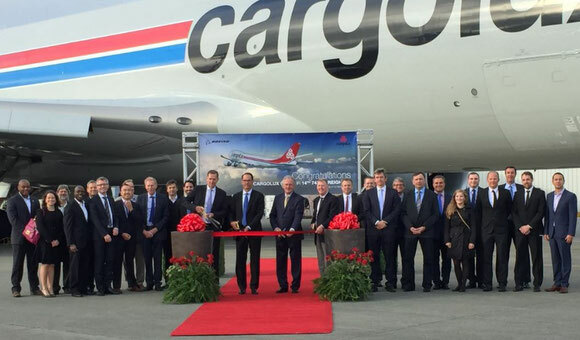 LX-VCN brings the Cargolux fleet to 26 Boeing 747 freighters, the largest the company has ever operated and one of the largest in the world operated by a classic freight airline. Hong Kong Air Cargo Terminals Ltd (HACTL) has replaced manned check booths at vehicle entry points with automated lanes that register trucks and obtain details of vehicle size and purpose of visit. The new truck management system that is now in place, prevents jams, speeds up processing times, ups parking capacity and enhances security at Hactl’s SuperTerminal 1 - the single largest multi-level air cargo terminal in the world - which receives over 2,000 trucks per day, delivering exports and collecting imports, states the operator. Vehicles approaching SuperTerminal 1 can also pre-register their arrival using an app (COSAC) this way taking advantage of a fast-track entry lane fitted with ANPR (Automated Number Plate Recognition) equipment, that further reduces average entry time by 70% to just 5 seconds. The former Executive VP Global Cargo, Nils Pries Knudsen, was promoted to Chief Commercial Officer of Swissport International. Nils has taken on his new role on 1 October, reporting directly to Eric Born, Group President & CEO. Mr Knudsen joined Zurich, Switzerland-based Swissport International in January 2009 and has since been instrumental in taking the Cargo Division forward to become a global leader. 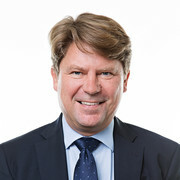 Prior to this, he served as Head of Global Sales at SAS Cargo since February 2007 until January 2009. In his new role, Nils will be responsible to further enhance the commercial and sales strategy and drive profitable growth for ground and cargo handling. Besides providing ground services for around 230 million passengers, Swissport International handles 4.1 million tons of air freight a year on behalf of 835 customers. About 61,000 personnel are working for the company, generating consolidated operating revenues of €2.7 billion annually.